Since neither Sundazed nor Columbia came up with the idea of releasing this set officially, I had to go and do it myself. Here it is: THE COMPLETE DION & THE WANDERERS. 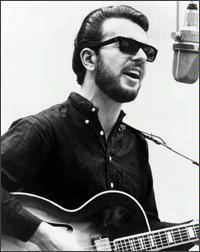 Dion DiMucci is one of the few enduring stars of the doo-wop era. A hitmaker with THE BELMONTS in the late 50s, he remained a hitmaker as a solo act in the early 60s. He then became the first rock'n roll singer to sign with Columbia Records, and the hits kept coming. And then, out of the blue, he changed direction and started cutting some gritty blues covers. Columbia didn't follow him down that road, and they only released a handfull of sides, when they had more than enough material for a whole album. He changed direction again and decided to play folk-pop. He wrote some songs, chose some good covers, his friend BOB DYLAN gave him a couple of tunes, and he put together a band, which he named THE WANDERERS. They went into the studio with genius producer TOM WILSON. Wilson had worked with Coltrane, Sun Ra, Dylan... and would later produce The Velvet Underground, The Mothers of Invention, Soft Machine... In my book, if he's not the best record producer ever, he's second only to PHIL SPECTOR (incidentally, Dion worked with both). There were exactly two sessions, on September 20th and October 4th of 1965. The twelve songs they recorded all showcase superior, unique genius. Dion is at the top of his game both on vocals and on guitar, his songwriting is diamond perfect, his band is loose just the way I like it, that Tom Wilson sound is unmistakable, this is better than perfection, this is heaven. Yet, for some mysterious reason I cannot and will never understand, Columbia shelved the whole thing. They released a couple of 7" and left everything else in the vaults. Dion at this time was addicted to heroin, too weak to fight back. Instead, he bought himself out of his contract, cut a remarkable reunion album with The Belmonts for ABC Records, and then went back to his old label, Laurie Records. For Laurie, he went full-fledged folk, and his first folk single, ABRAHAM, MARTIN AND JOHN went top five. Dion was back. So Columbia decided to release an LP with some of the songs they'd been sitting on. Released in 1968, WONDER WHERE I'M BOUND contains five songs from these sessions, four from his previous blues period, and one doowop from 1963. Although it's a great collection of songs, it's also an incoherent mess. Plus, in 1968, folk-pop was smelling funny, and the album flopped. I'm convinced that, had this set been released as an album in 1965, it would be considered a classic. If you are as obsessed as I am, you might wanna know who plays on these tracks. You can see them on this picture. CARLO MASTRANGELO plays the drums. He was already in The Belmonts. PETE FALCIGLIA plays the bass. Also an Italian-American from the Bronx, he cut a couple of sides as a lead singer with The Belmonts for Sabina Records, after they'd split with Dion. JOHNNY FALBO is a session man, a great guitar player. Not on the picture, AL KOOPER needs no introduction, he's an extraordinaire session man and a great singer-songwriter in his own right. He plays the piano and the organ on these tracks, as anyone with ears could tell. So there you have it, an album that never was, a missing link in the history of American music. I hope you enjoy it as much as I constantly have for many months. yo Mat! Been loving your words of musical wisdom on whistletaste!! FYI, the link to your Dion comp is dead: "The file you are trying to access is temporarily unavailable." Bummer - can you re-up? thanks for the opportunity to hear these songs. I've been playing the "Wonder Where I'm Bound" and 1968 "Dion" album non stop of late. It's made me super keen to delve deeper in this folk phase. I love the track "Wake Up Baby" ... who's the person Dion's dueting with? Sadly, after a lot of research, I still haven't found out who sings backup on Wake Up Baby. I heard that the Wonder Where I'm Bound album is bound to be reissued, with liner notes by the great rock archivist Andrew Sandoval. Hopefully these notes will reveal the identity of the mystery singer. By the way, there are more obscure B-sides and whatnots in the folky Dion vaults. Check this blog often as I probably will upload more soon. waiting with bated breath for more. The song i can't get enough of is "Time in My Heart for You". excellent song. I made a similar comp for myself recently as well, same songs but with a slightly different order. I'll give your sequence a spin and see if I like it better than mine. I'm kinda hooked on the idea of ending the album with "Farewell"...There's a reoccuring theme of leaving and moving on and distance throughout the album. I'd love an official release of these songs collected together. Its definitely a lost masterpiece of the 60's. The new "Wonder Where I'm Bound" CD release finally provides us with great sounding versions of "Now", "Wake Up Baby" and "Farewell" in a digital format. No one seems to remember who the girl was who sang on "Wake Up Baby". Ach, yer a genius. I've scrabbled together digital versions of most of the Wanderers tracks, though some in a low bitrate, and haven't ever grouped them into a comprehensive album. I like the commenter above's approach to ending with Farewell too though, so I will play around with the running order. The point is, thanks for bringing all these tracks together alongside such scholarly "liner notes"! Not to mention that killer picture sleeve! I just got the new WWIB CD tonight and came looking for better versions than I already had of those other Wanderers singles sides. I'm glad you found "So Much Younger" for the "bonus tracks" post too, I wondered where that one was! I could never figure out why, after Bronx Blues and The Road I'm On, Columbia would never release a more comprehensive and better-organized collection of these tracks. Perhaps those discs did not sell well enough to motivate them to. Anyway, great to find your blog! Please come have a look at mine and see if there's anything you like! Somehow you missed mentioning the wonderful (but thrown together) double cd "The Road I'm On". Horrible cover, doesn't even look like Dion, but great stuff. 6 Dion and the Wanderers cuts*!! (I know, why not 12) lots of GREAT Dion blues cuts, "Donna, the Prima Donna" in english and ITALIAN. I'm curious why "It's All Over Now, BB" is not considered a D&W cut; it certainly sounds like them. I remember hearing "Tomorrow....." when it first came out, and dashed out to buy it w/o a second thought (took a lot of searching). Years later, I found the promo with the killer picture sleeve. bought all those singles. And disappointed that there was never a D&W LP. 1. You say "Complete" D&W, but there are 2 tunes in the session list (on Phnom Penh website) not included. "Bright Lights" and "Blues". I realize you may not have them, but can you still call it "complete"? 2. Someone mentioned "So Much Younger" but I'm not familiar with it, and I don't see it in the download. * six D&W trax on "Road I'm On"
Yes I know it's not litterally complete, but here are all the DIon & The Wanderers songs that were ever released... so far. Thank you so much for this. Wow— its great. Wow, this looks great. Any way to get this reuploaded now that megaupload is gone? Can I second the plea for a reup? 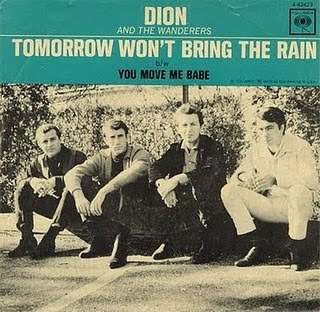 Thanks for shedding some light on Dion and the Wanderers! Great music! When setting up my Dion and the Wanderers (DATW) lost Columbia Sessions listing on Youtube I gave myself a problem because I included "Its all Over now Baby Blue" knowing it wasn't a DATW official session - but sounds like it is. Just 10 Tracks released by Columbia on singles or the 1969 cash-in album Wonderer Where I'm Bound (WWIB) and then mainly re-released on compilation CD's (Bronx Blues, Road I'm On , Don't Start me Talking and WWIB). These all cover Dion's entire Columbia output but until Andrew Sandoval did his notes on WWIB, fans had little knowledge of DATW. • 66 Occasional recording + occasional tours . Contract ended Mar 66 . What's in a (group) name ? Fans (myself included) have literally gone on what its says on the label, to define the group and so have just 10 tracks for this seminal group (see part 1 ) . But lets start off with how this group was NOT formed. It wasn't an advert in the music press "ex-pop star wants backing boy band, no previous musical experience essential"
Dion pulled this group together, organically over time. He started off with the lead singer and rhythm guitarist and then added John Fablo on lead guitar. So by the time he resumed his blues sessions, in March 65 he already had the group front line in place and only needed to find the right rhythm section to fit in . However we have no details about personnel, but they are beginning to sound like the Wanderers . They sounded much the same, because it was much the same personnel involved in making the tracks , until somebody (Norman Petty?) put a name on the record label. This is exactly what we have with Dion and / or DATW from March 65 onwards. I'm not sure if this was the order but it represents a sudden leap . Baby Blue is of course not a blues but a contemporary Dylan song and suddenly everything is clicking in place - The DATW sound is there . Robert Mersey was behind the production desk and presumably heard nothing new, because this was left on the shelf until 1969 WWIB. UNCUT in its review of the WWIB CD said : "Yet as convincing as these performances are, it’s the experimental, finger-on-the-pulse-of-1965 folk/rock material that’s most fascinating. “It’s All Over Now, Baby Blue”, ... – a candidate for definitive version of this great song. Dion pours it all out here, with an impassioned, beautifully melodic vocal, infusing the lyric with an eloquent, measured desperation Amazingly, Columbia weren’t completely enthused, but heard enough promise to match the singer up with Wilson, fresh off groundbreaking Dylan sessions "
What a shame Columbia suits had no vision, Baby Blue could have been a huge hit if released on a single. On the back of a hit, they could have released the other singles with more chance of success and an album to get DATW off into the emerging adult market. With Baby Blue, the Wanderers in all but name were up and running..
• Waiting for Tom Wilson to be free. • Al Kooper -Keyboards - presumably introduced by Wilson and had been working on Dylans Like a Rolling Stone. He went on to found the 1st version of Blood Sweat and Tears and became a legendary producer of acts such as the Super Sessions. Tom Wilson was starting to build his reputation as a super producer. He had famously added a backing track to Simon and Garfunkles Sound of Silence and turned it into an overnight success . But his producer CV was to be extensive including Dylan, Zappa and the Mothers, The Velvet Underground (with Lou Reed) and a wide range of jazz artists. The session starts off where the other left off, with another outstanding Dylan cover, before launching into contemporary and self written songs. Outside 2 Ton Feathers, blues only features as part of the make up of the songs. But what great album songs (and maybe not singles) we have here. Dion was no longer a teenager in love; these songs are directed at an emerging adult orientated album market. Dion is building on his personal song writing skills heard in classics like "No Ones waiting for me" and "The Road I'm on Gloria". These were all recorded at the same sessions but some are labelled Dion and some are DATW. But just use your ears, the sound of a group can be heard on all tracks. These tracks were made to be played as a whole album in 1966, not spread amongst the pop hits, easy listening, folk and blues experiments 30 years later. Its time that they got their correct setting. • Feb-Mar 66 2 Ton Feather recorded and released and contract terminated. While the artist label name may change from track to track, the overall group feel is the same. If in doubt just rip them off from your existing collections and see how it flows. I hate to disappoint fans, but one possibility is that, other than these 3 tracks, there could be no more missing tracks. All the DATW lost tracks are hiding in plain sight; they have just been mislabelled as Dion tracks. The impact of these sessions was lost by the scatter gun approach releasing them over a number of Columbia collections - continuing the process started in 1969 with WWIB LP. However just by pulling these tracks off those Columbia general CD's and putting them in context (lead track Baby Blue), you can hear an extremely powerful, criminally lost 60s album. It was partly poor timing. Just over a year after Dion was dumped by the Label, President Clive Davis the new president, attended Monteray Pop and had his eyes opened about the new emerging sounds and redirected the label to the rock market .He did eventually catch up with Dion, when his Arista label released Yo Frankie in 1989. If somebody will return the vaults and do a full archival job on DION AND THE WANDERERS LOST SESSIONS 1965 -66, I'm sure fans will be more than happy to buy the same tracks again, along with any still unreleased gems. Can we trust Columbia/ Sony to get the job right after 5 decades? Any chance of a re-up? Pretty please?